A morning at Borough market, Turrón semifreddo with marinated cherries | dash.drizzle.dollop.devour. When I first moved to London I lived just a couple of streets from Borough market, so barely a weekend would go by without me passing through for one thing or another. I still love to go there, content to drift along with the tides of people surging through the place. Whilst there has been a proliferation of excellent markets across London, Borough remains the grande dame, unbeatable for quality and variety, even if the prices can be a little ambitious. My favourite place in all of London is probably the pavement opposite Monmouth coffee, sitting on the kerb with a cup of steaming coffee, listening to the rumble and creak of trains passing overhead, watching the world go by. I came away with a little haul of San Daniele ham, jars of the fattest Spanish chickpeas, blackcurrants, bread, beautiful mixed tomatoes of all colours and sizes. 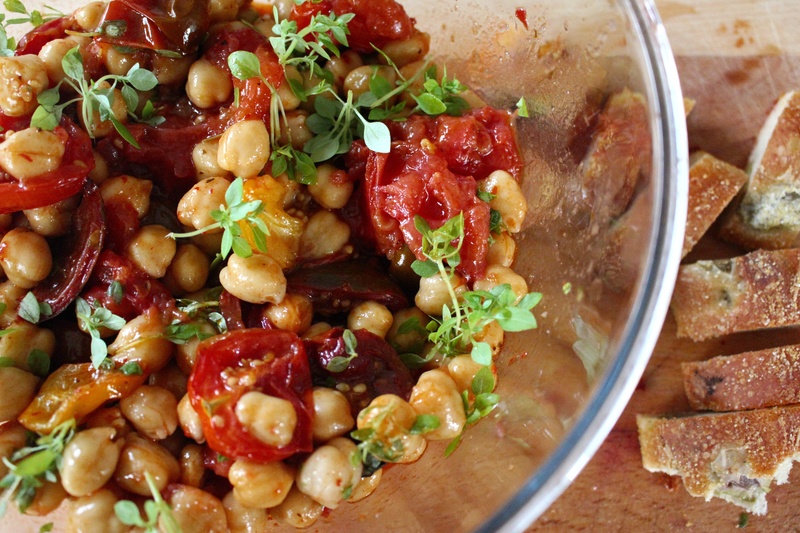 Supper was a mix of everything, inspired by one of my favourite Nigel Slater recipes – roasted tomatoes tossed together with the chickpeas, some harissa and basil, with slivers of the ham draped over the top. I also bought a bulging 1kg bag of fresh, sweet Kent cherries. I don’t know why cherries taste so much better eaten out of a paper bag. There is little you can do to them that will improve on this simple pleasure, so barely any of were still in the bag when I eventually made it home, with purple stained fingers and a trail of discarded stones in my wake. So to another almond and fruit based dessert this week, this time using turrón, which is a beautiful Spanish almond sweet, sadly it seems, only available in special Spanish shops or online in the UK. I try to bring a stash back with me whenever I go to Spain. In fact, I love it so much I would probably consider getting on a plane especially. There are a few different types of turrón, but for this recipe I used my favourite – turrón blando. How to describe it? Its made of ground almonds, which are sweetened with honey and then formed into a firm block. Its much denser than marzipan and has texture like crumbly fudge. It has a rich caramelised almond flavour, lovely with a cup of coffee, but I decided to experiment and form it into an easy ice cream. As with any semifreddo recipe, no churning is necessary because the air is incorporated by whipping all the various ingredients. Hence you will need 4 mixing bowls for this I’m afraid. And life is made much easier if you have an electric hand whisk, as every element needs whisking separately. Start by separating 2 eggs and placing the yolks into 1 bowl and the whites into another. Whisk the egg whites until they form soft peaks. Then add 50g caster sugar, spoonful by spoonful, still with the mixer running to form a light meringue. Set aside. Next, add another 50g sugar to the egg yolks and whisk for a few minutes until pale and fluffy. If you lift the whisks out of the mixture it should leave a visible trail in the mixture. Set aside. Crumble 150g turrón blando into a third mixing bowl. Add about 50ml double cream and whisk until you have a smoothish thick cream. Add 1 tbsp amaretto (optional). I n your final, largest bowl, gently whip another 250ml double cream until soft peaks form. Then fold in the turron cream, followed by the egg yolk mixture, then the egg white mixture. Try to fold gently to preserve as much air as possible in the mix. Line a 20cm loaf tin or other vessel with cling film, which will make it easy to unmould once frozen. Pour your mixture into the tin, cover and freeze for 3-4 hours. I served mine topped with pitted cherries, gently marinated in a little brandy and sugar. I do possess a cherry stoner, probably purchased at a moment of weakness, going against my anti-gadget policy. So I dusted it off for its annual use and pitted about 300g cherries. It does the job pretty efficiently, although the kitchen does end up covered in cherry splat. I doused them in a couple of spoons of brandy, although a slosh of amaretto would’ve been my first choice, added a couple of spoonfuls of caster sugar and left to marinate for an hour in the fridge.